Also, we are on the lookout for individuals who are keen to host some of the events. For that, drop us an email with your details and we’ll schedule you for a short audition when school starts! Our NUS counterpart, the NUS Literary Society, has an online magazine as well! You can check out their first issue on their website over here (alternatively, click on the image above for a link to Symbal, The NUS Literary Society’s Magazine). So why not take a break from all the revision and enjoy some excellent writing from our friends in NUS? 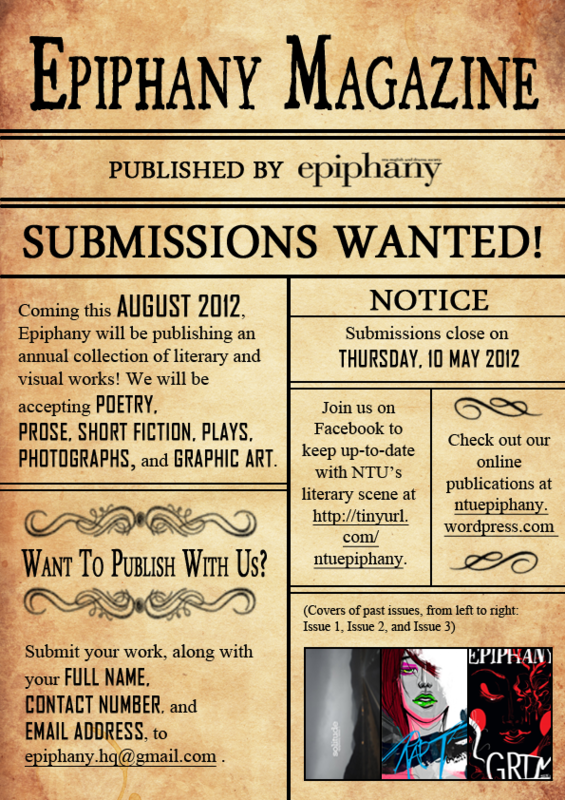 If you haven’t been published yet, send in your work to us by 10 May 2012 and you may just get the chance of being featured in our physical issue! Do email us if you have any queries. Alternatively, drop us a message on the FB event’s page right over here. Our final issue will entertain you through cups of hot chocolate and fortresses of pillows and blanket as you snuggle up to a loved one at home this rainy season for warmth. A BIG THANK YOU to all who have contributed to the success of Epiphany’s online magazine this semester. We hope to bring you more next semester, including a physical issue you can touch, sniff and ingest come August! Good Luck on your final lap to that shiny A+ and, a long vacation! and not without the seductive face of the GRIM lady, conjured up by graphic wizard Joan Chong, hovering over you at night (a gift from us). Unleash the beast, and send him in any one of these forms: written, graphic, photographic, musical or the moving image to epiphany.hq@gmail.com with your Name and Contact number. Submission call for April’s issue is now open till Friday, 23rd March 2012. The results for our Hemingway Shortest Story Writing Competition are in! Epiphany would like to thank Professor Jennifer Crawford for graciously being the judge for the competition, and also our various sponsors and partners – Caran d’Ache, Jaben and BAGGU. Last but not least, a big thank you to all our participants for helping make this event a success. Offering at altar. Homeless woman bites. He bobbled. Currents, vanishing into petals. Stalwart wall. You seep through. Collapse. Please come down to our Theater Showcase tomorrow night for the awarding of prizes. Thank you. Come join us for the first night of Epiphany’s week-long LitFest! Get FREE popcorn! 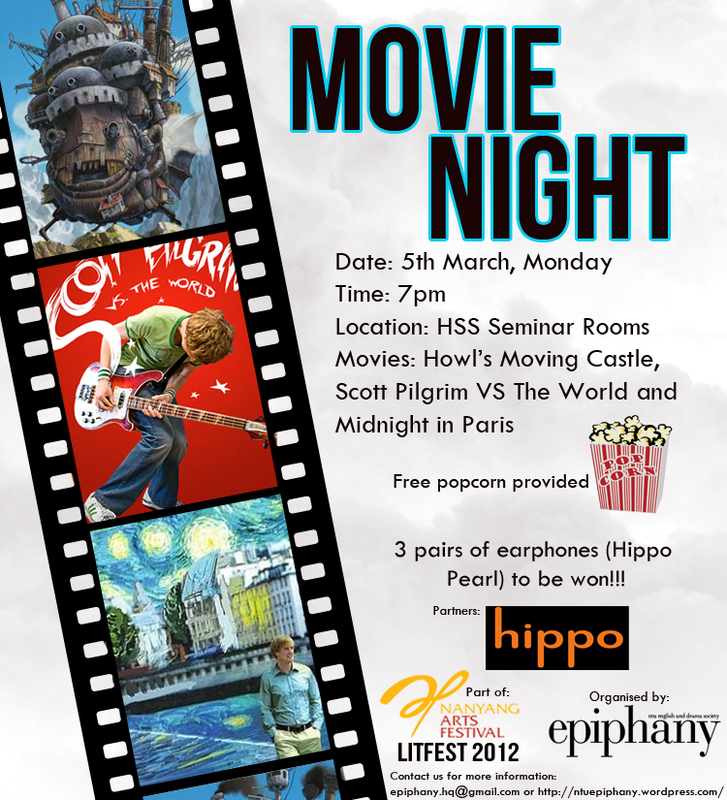 You might even win a pair of Hippo Pearl Earpiece worth $36 in our Lucky Draw!!! Come down with your friends for a night of fun!